The sudden rise in Treasury yields reverberated globally Thursday, dragging up yields across bond markets, hammering emerging-market currencies and stocks, and underlining how the U.S. economy has powered ahead even as the rest of the world is struggling to keep up. Treasury yields jumped to 3.19%, the highest level in eight years, according to Tradeweb, after climbing sharply on Wednesday on fresh evidence of a robust U.S. expansion. The dollar strengthened against several emerging-market currencies, with the Indonesian rupiah, Turkish lira and the Russian ruble taking a beating. Treasurys are the key benchmark for global investors and their rising yields pull up borrowing costs globally despite local economic conditions. 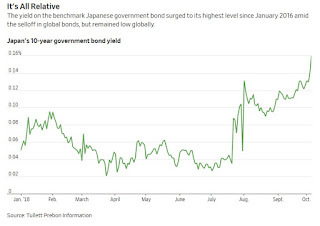 U.K. 10-year bond yields briefly reached their highest point since before the country’s Brexit vote Thursday, while equivalent Japanese yields touched their highest level since January 2016. 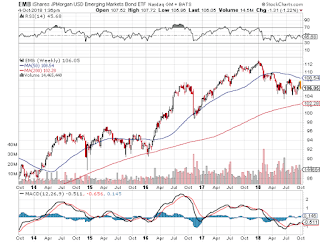 Yields in emerging-market countries rose, with Philippine government bonds at their highest yields since 2011. Thursday’s market reverberations highlighted a recurring theme of 2018: the outperformance of the U.S. economy. That has allowed U.S. stocks to march higher this year even as concerns over trade tensions and less robust growth have weighed down European and Asian markets. One of the starkest examples of the divergence: Even though 10-year German bond yields climbed Thursday, their gap with Treasurys still widened to around 2.7 percentage point, an increase of about 0.7 percentage point this year, according to Refinitiv. That is the widest level since 1989, before the fall of the Berlin Wall. 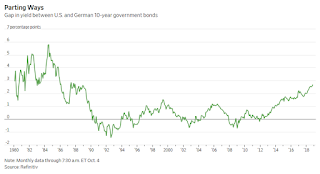 Mr. Tipp said the difference between German and U.S. bonds could widen to 3.25 percentage points in the near term, citing a variety of reasons including rising bond issuance in the U.S., as well as near-term worries over Italy’s anti-establishment government weighing on sentiment toward the eurozone. Still, in the longer term “the market is too far apart” and is likely to converge as “European growth stabilizes and the U.S. comes off the boil,” he added. The moves came after data showed U.S. services-sector activity hit a record in September and private payrolls expanded far more than expected. That bolstered investor expectations that the U.S. economy will continue to strengthen, allowing the Federal Reserve to keep raising interest rates, even if the recovery in the rest of the world appears less steady. Chairman Jerome Powell said Wednesday that Fed policy was “a long way from neutral”—meaning there is significantly more room for interest rates to rise before they start to hinder growth. The selloff in Treasurys is sparking frenzied trading, a boon for banks. U.S. government-bond trading volumes increased 25% in September from a year before, according to Tradeweb, in a sign of how rising yields are sparking a flurry of activity on trading desks. European government bond volumes were up 20% in the same period. Higher U.S. rates and optimism about the U.S. economy also pushed the dollar higher against emerging-market currencies, which have been under pressure this year. 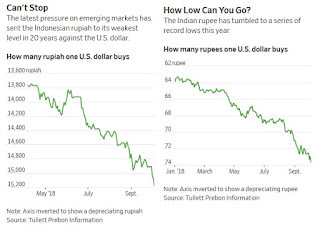 Indonesia’s currency, the rupiah, dropped to a fresh 20-year low, while the Indian rupee hit the latest in a string of record lows. The Turkish lira slumped 1.3% against the dollar and the Russian ruble fell 1.1%. 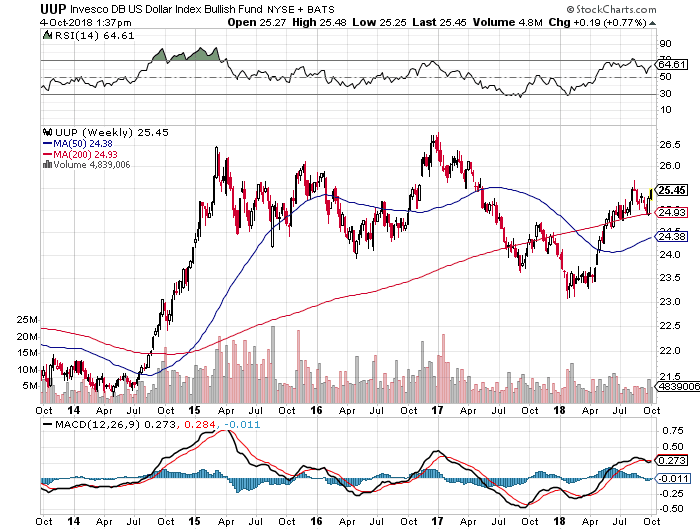 “The dollar has free rein now to stretch its legs and push higher,” said Gareth Berry, a foreign-exchange and rates strategist at Macquarie Bank in Singapore. This points to further difficulties for emerging markets, analysts say. A stronger greenback makes it more expensive for countries and companies to service and repay dollar debt. Central banks have been forced to raise rates to defend currencies, making domestic borrowings costlier too. And higher U.S. rates reduce the relative appeal of riskier assets elsewhere. Yield-hungry investors who had proved eager to jump in and buy stocks and bonds in developing economies after previous bouts of stress have been more hesitant to do so recently, citing uncertainty about the outlook for global trade and economic turmoil in countries such as Turkey and Argentina. Bank Indonesia said it intervened to stabilize the rupiah by selling dollars on Wednesday. It has already lifted its benchmark rate five times since May in a bid to attract foreign cash. And although Chinese markets remain shut for holidays, the yuan traded in the offshore market and fell back to near multiyear lows, with one dollar buying 6.8975 yuan. Some analysts reckon the People’s Bank of China will try to prevent the yuan from weakening to 7 per dollar within the next few months—a level that could spook domestic investors and trigger capital outflows that would further disrupt an already slowing economy. Still, China, like the rest of the world, will find that it is hard to fight the Fed. “I still see depreciation pressure at this moment because there is a divergence between the Fed and PBOC monetary policy,” said Ken Cheung, senior Asian currency strategist at Mizuho Bank in Hong Kong. 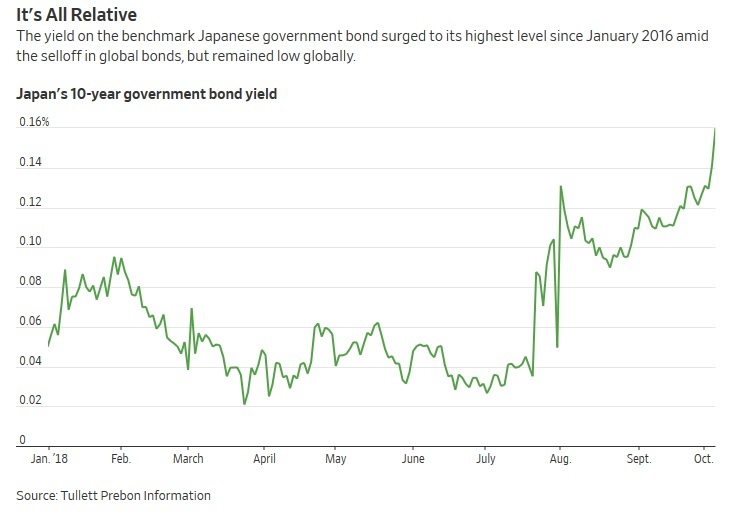 A sudden sell-off in government bonds spread across the globe on Thursday as signs of a strengthening US economy bolstered expectations of further interest rate rises from the Federal Reserve. 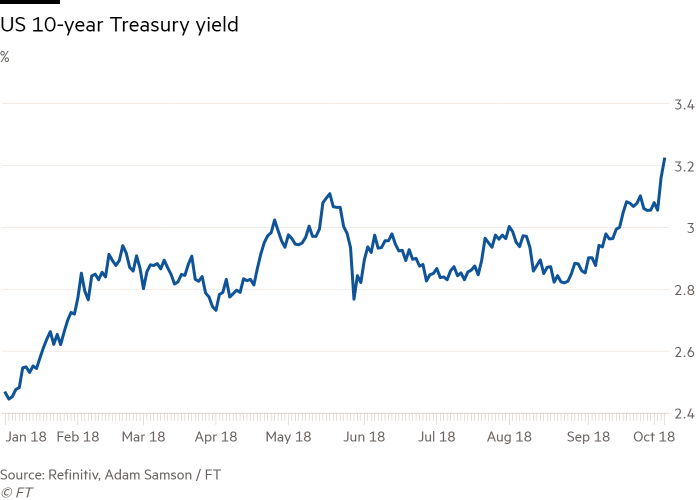 Yields on US Treasuries had on Wednesday seen their biggest one-day increase since the bond market turmoil that followed Donald Trump’s presidential election win in 2016. The jump came after stronger-than-forecast private sector US jobs data and upbeat numbers from the services sector. These in turn raised expectations of more robust non-farm payrolls figures, due on Friday, that will inform the outlook for US rates. The 10-year US Treasury yield jumped 11 basis points on Wednesday to 3.16 per cent, just off the session high of 3.18 per cent, the highest level for the global benchmark for bond markets since July 2011. That has led to further pressure on Asian and European bond markets and losses in emerging market currencies against the dollar, which was boosted by the higher bond yields. In European trading, the yield on 10-year US Treasuries reached a fresh seven-year high of 3.2320 per cent. 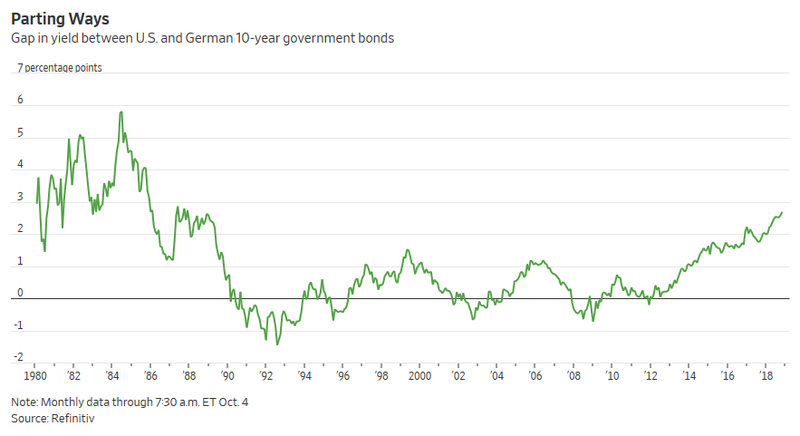 The equivalent German benchmark yield moved back towards 0.6 per cent, a level last held by the debt in May. The sharpness of the moves indicated that some investors might have been badly wrong-footed by the sudden jump. Rising interest rates depress the prices of bonds in the market because yields on other investments rise, and existing bonds in the market are worth less to investors. “This is an important moment for global markets, and we are looking at the start of a significant change in trading patterns, said Koon Chow, Macro and FX strategist at UBP. Lee Hardman, currency analyst at MUFG, said the move higher in US yields tracked “increasing confidence” that the Fed will be able to increase interest rates above 3 per cent in the coming years. “As a result, it signals additional upside risks for US yields,” he said. 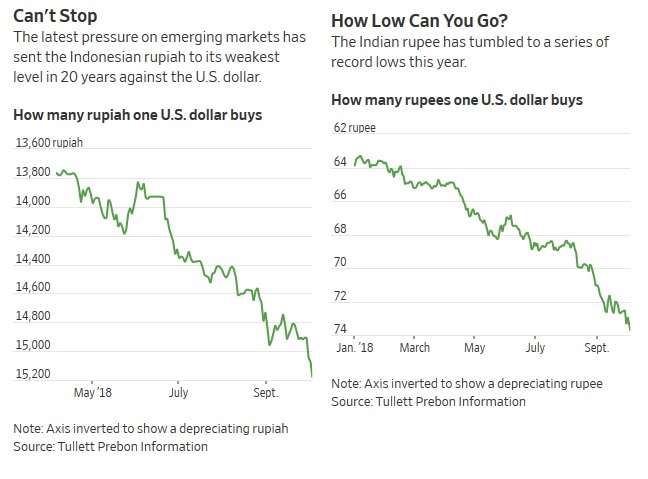 An index of the dollar against other currencies was up 0.3 per cent, taking its year-to-date rally to 4.2 per cent and leaving emerging market currencies looking particularly exposed. 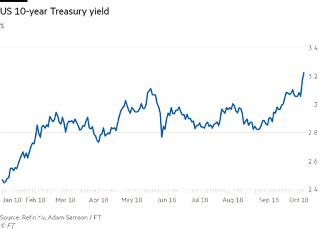 The MSCI EM FX index, a broad measure of emerging market currencies, was off 0.6 per cent and on track for its worst day since August, when a plunging lira thrust Turkey into a full-blown currency crisis. Indonesia’s rupiah slipped a further 0.7 per cent to a fresh two-decade low of Rp15,180 per dollar. India’s rupee was down 0.5 per cent at Rs73.7475, after touching a new record low earlier in the day. The US payrolls data on Friday are expected to show the addition of 185,000 jobs in September and the unemployment rate dropping to 3.8 per cent, matching the May figure for the best level since 1969. A private sector payrolls report, also out on Wednesday, showed the biggest increase in seven months, adding to bullish expectations on the US economy and inflation. That added to data that showed activity in the US services sector accelerated to its highest on record in September, according to the Institute for Supply Management. Stock markets remained unnerved by the sudden extent of the moves for bonds. The Europe-wide Stoxx 600 slipped 0.6 per cent, with futures trading expecting an opening drop of 0.5 per cent for Wall Street’s S&P 500. The FTSE 100 index was 0.9 per cent lower. 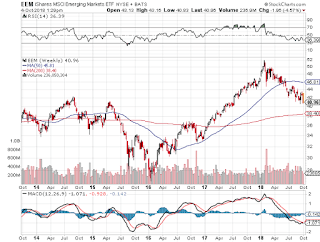 Selling was sharper for emerging market equities. 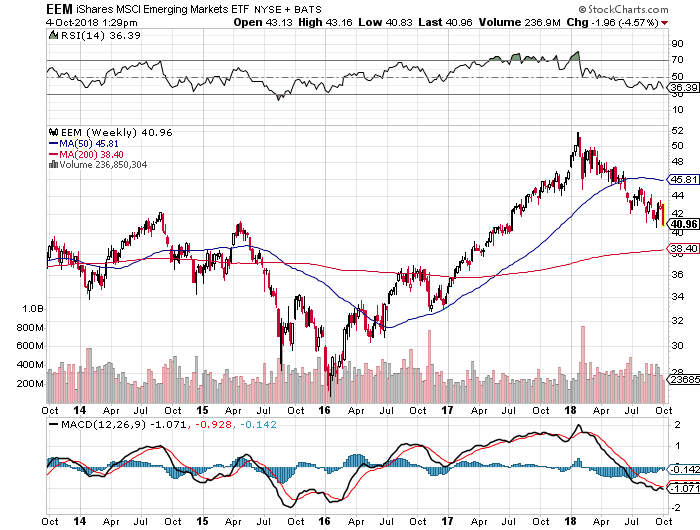 The MSCI EM stock index, which tracks trading across 24 nations, was down 2 per cent, on course for one of its sharpest falls for 2018. Mike Bell, global market strategist at JPMorgan Asset Management, warned that emerging market economies with large current account deficits and high external debt levels could face disruption as funding conditions changed. “Developed equity markets also have to calculate the extent to which higher growth and inflation will offset higher interest rates,” he added. It's a huge week for bonds, one that quite frankly caught me offguard as I wasn't expecting it. 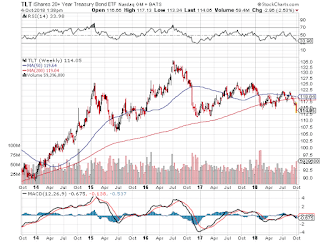 Let me begin my comment by stating flat out, I'm not a bond bear, quite the opposite, and think every time the yield on the US 10-year Treasury bond spikes above 3%, it's a huge buying opportunity for global investors. Can the yield on the 10-year touch 3.5% or even 4%? Maybe but I doubt it, I think it's the last big move up in bond yields before the US economy falters along with the rest of the world. Inflationistas and those who think otherwise are delusional, financial risks are rising and my worst case scenario -- namely, the Fed making a huge policy error and hiking rates too much -- is at risk of becoming a reality. Note these are 5-year weekly charts above, the ones I use to gauge long-term trends. Admittedly, the last chart of bond prices isn't bullish but it also shows me US long bond prices are near an important low (ie. bond yields near an important high) and it could be time to load up on US long bonds now. With the Fed raising rates, the US economy will slow materially over the next year or two. More importantly, global PMIs have rolled over and are headed south, which tells you the global economy is weak and disinflationary/ deflationary headwinds are picking up all over the world. Nonetheless, I asked two fixed income experts I know, Brian Romanchuk and Simon Lamy, what they think about the global bond selloff. Brian and Simon had high-level positions at the Caisse's fixed income group and they definitely know their stuff. Brian who is the publisher of the Bond Economics blog shared this with me when I told him it's odd to see bonds sell off at this stage of the cycle: "Not really watching markets right now, but the story in the article makes sense. We’re in a rate hike cycle; the rise in yields so far has been tepid when compared to past history." We must keep in mind that we are coming out of a period of very low volatility on the interest rate market. I believe that the Treasury market is starting to adapt to the new Fed chairman. The normalization of rates has been going on for a few quarters and as long as nominal rates are significantly lower than nominal GDP growth, I do not see how this trend can be reversed. On the other hand, I think Canadian rates are too low versus US rates. If we believe that the "NAFTA" premium has been deflated since the beginning of the week, this leaves the field open for the Bank of Canada to follow the policy of the Fed. 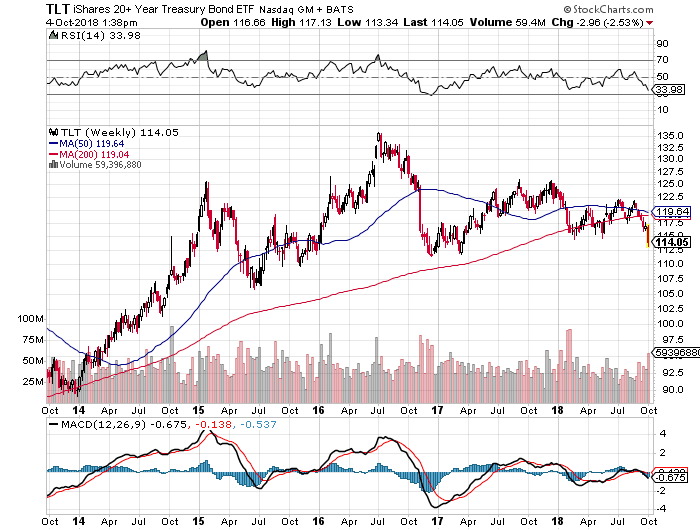 I remember Simon telling me the long-term neutral rate for the 10-year Treasury bond yield is 3%, so when it goes near 2%, he shorts bonds and when it goes near 4%, he goes long. I thank both these gentlemen for sharing this with me but I continue to worry about developments outside the US and global deflationary headwinds picking up. 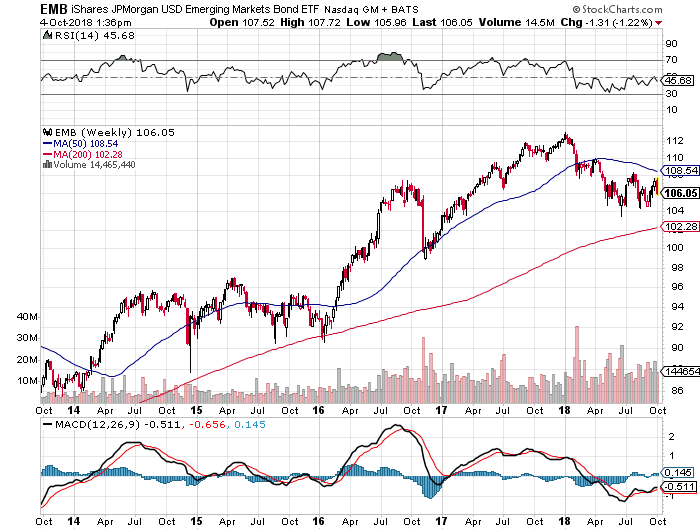 In particular, if the US dollar continues to surge and US long bond rates continue to go up, a lot of emerging markets are going to be in big trouble, and we might be close to another crisis there. If that happens, you will see US long bond yields and the US dollar rally at the same time, a classic flight to liquidity when global investors panic and search for safety. Let me end with a brief discussion on rising bond yields and pensions. Typically, when bond yields rise, that's good news for pensions. Why? Because the discount rate to discount future liabilities rises, so higher bond yields are generally good for pension plans. But what about assets? Won't higher bond yields hit risk assets across public and private markets? Yes but because the duration of liabilities is a lot bigger than the duration of assets, typically higher bond yields will be beneficial even if assets get hit. 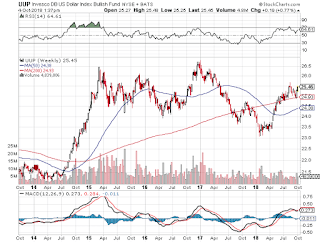 However, if the US economy falters, bond yields will go lower at a time when assets get hit, the perfect pension storm. This is what I fear is going to happen over the next 18 to 24 months. Below, Kevin Giddis, Raymond James head of fixed income, and Mark Cabana, Bank of America head of short rate strategy, discuss how bond markets are responding to the rising interest rates. Has the bond market really thrown in the towel? Is a major bout of inflation upon us? I seriously doubt it and would caution my readers to take bearish bond comments with a shaker of salt.